Well, not quite. Two matches, yes, both involving West Park Leeds playing at home, but separated by six days. For two weekends in a row, ickledot has been the guest of the Bramhope club, first to photograph the mighty women's team playing Eccles last Sunday and then the formidable men's team opposing Old Grovians Saturday last. Poor Old Grovians are likely to become wary of me. Last time we met was last season when they went to Pontefract with a depleted squad. Unfortunately for them Pontefract took full advantage and, as my headline said at the time, they piled on the points. On this occasion Old Grovians were able to compete much better and, though ending the game twenty points adrift of their hosts, they posed problems for West Park throughout. 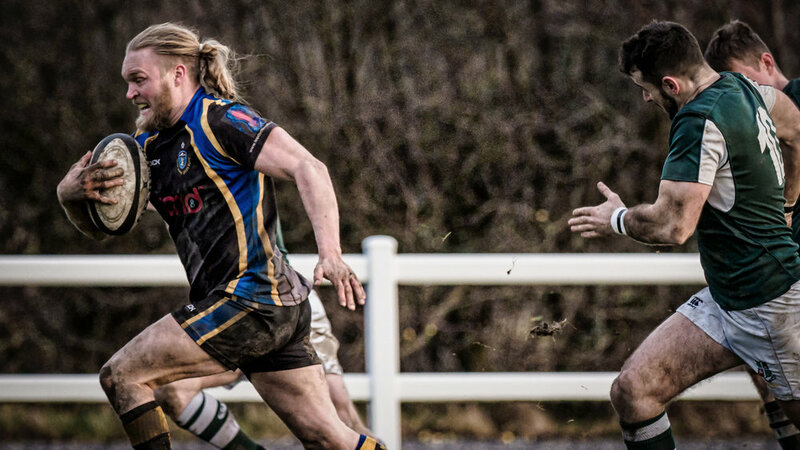 The 32-12 victory moves West Park up to sixth place in Yorkshire Division Two; a satisfactory position given their opening run of five defeats out of six. Quite a recovery in fact. West Park's women had proved far too strong for Eccles the previous Sunday. They've won every game so far this season and the eighty points scored in this match was not even their highest score (81 v Lichfield). After a terrible week weatherwise (and a stormy Sunday following), the men's game was played mostly in bright sunshine. This was great photographically, while it lasted. However, as we're still in January the light fell away during the final quarter, the resulting pictures becoming ever more grainy. The story was similar for the women's match: a reasonably bright start followed by a final twenty minutes or so of gloom. Flickr's the place to view more pictures of the game, here and here.